Mahakali Temple, a very famous holy place in Naldehra, is located on the banks of the serene Mahakali Lake. The main deity of Mahakali Temple is the Goddess Maha Kali. It stands with all its godliness and might on the banks of a river called Mahakali. The beautiful scenery of the mountains and valley add elegance to the beauty of the place. Travellers may visit the temple and explore the beauty of the surroundings by taking a leisurely walk around the beautiful lake. Additionally, the shrine offers a glimpse of mountains and lush meadows located around the region. 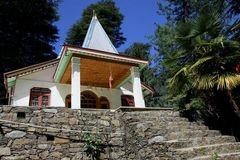 So, if you looking for a peaceful holiday in the ranges of the Himalayas in complete privacy, then this temple is the best attraction where you can unwind and enjoy memorable moments with your loved ones. Festivals This temple celebrates Kali Festival round the year with huge éclat and show. Where to Stay Tourists can opt to stay nearby Mahakali Temple in Naldehra as there are quite a few accommodations options that offer a comfortable stay and are equipped with modern amenities. Where to Eat There are some famous restaurants in Naldehra that are in proximity to the Mahakali Temple. You can pamper your taste buds with scrumptious food offered in these restaurants.